Recently, Currey & Company’s president, Brownlee Currey, spent some time overseas visiting our factories in Asia. Below he shares a story from his trip which gives insight into the attention to detail and workmanship that goes into our vast product line, his fascination with the alignment of the panes that make up the Buckminster chandelier a fun read. Some things will never be easy. Walking through our steel shop in March, I was struck by two of our workers, huddled closely together assembling a chandelier. In our factory, assembling a chandelier is usually a one-person job. In fact, it is so unusual to see two people working together to assemble an item that I stood back and watched for a while. 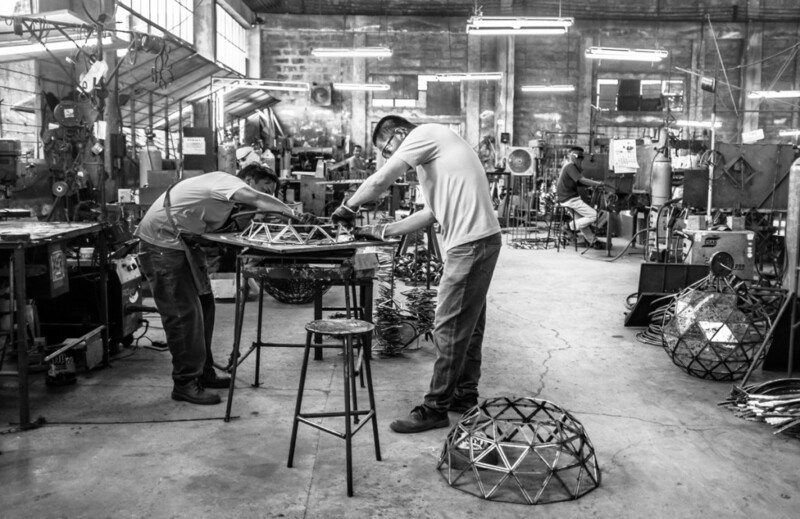 As you can see in the image, aligning all of the triangular steel frames that make up our Buckminster chandelier isn’t easy. In fact, even with the use of a jig, it requires the full and undivided attention of two people. If just one of the triangular frames is out of alignment, then the entire row of triangles will be off. As the design of the chandelier is about having all those shapes perfectly lined up, the importance of care and craftsmanship becomes clear. As I stood there and watched, our production supervisor, came up to join me. In an unusually forceful statement, he said to me: “I hope you don’t sell many of these.” For someone whose culture is not that of forthright interaction with others, let alone a foreigner, that is one hell of a thing to say. “Why?” I asked. “Too difficult to make, takes two people, two days, just to assemble one,” he said. We stood there and watched for a little while longer, and I did a little rough math. One hundred and twenty triangles per chandelier, to be put together over the course of two work days, works out to about eight minutes to get each triangle into place. I turned to the supervisor, who is also my friend, and said, “You know, that piece is probably going to do really well.” “Why?” he asked. “Because the hard things always do,” was my response. In May, I was back at our factory in the Philippines, and stopped again to watch the Buckminster being made. By that point, we had reordered twice so the alignment wasn’t such a challenge this time. The piece did well at the High Point Market and continued to sell well after market. As I stood there, watching, my friend walked up to me and said: “You were right, but now only five minutes a triangle.” I could only pat him on the back. 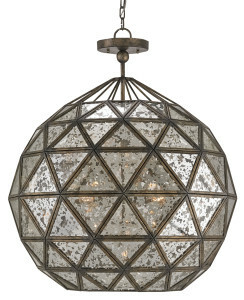 This entry was posted in Currey & Company, Products and tagged Chandeliers, design trends, Education, Lighting, Modern, Natural, Silver on May 14, 2014 by Currey & Company. GORGEOUS STORY! Love seeing the process come together! Great stuff, awesome story to share with our customers.